In small bowl, mix sauce ingredients. Refrigerate until serving. In 10-inch skillet or deep fryer, heat oil (1 1/2 inches) to 350°F. In shallow dish, place 1/4 cup of the Bisquick mix. Lightly coat fish with Bisquick mix. In medium bowl, beat remaining 1 cup Bisquick mix, the chili powder, salt, beer and egg with wire whisk until smooth. Dip fish into batter, letting excess drip into dish. Fry fish in oil 1 1/2 to 2 minutes on each side or until golden brown; drain on paper towels. Serve with sauce and lemon quarters. For tartar sauce with extra zip, simply stir 3 tablespoons spicy green salsa into 1/2 cup mayonnaise. 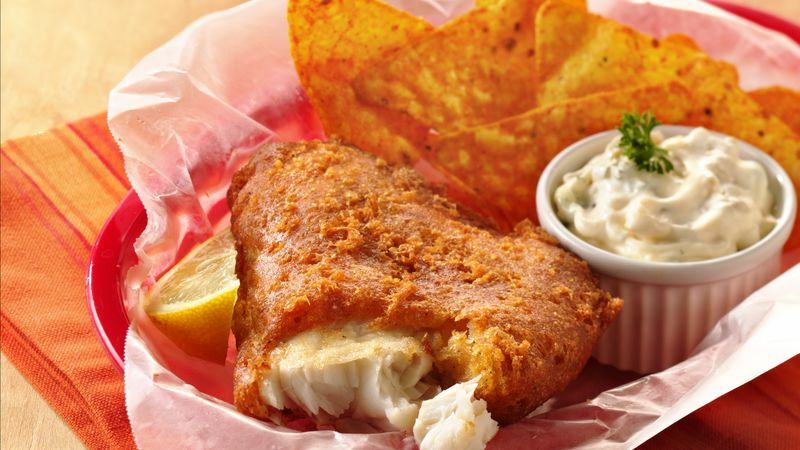 Coleslaw and oven fries would be great accompaniments to the fried fish.